A head-on collision in Tempe near Rural Road and Southern Avenue at 4:30 a.m. on Tuesday morning left two drivers seriously injured. According to the Tempe Police Department, one vehicle was heading west on Southern Avenue when it crossed over the middle lane and collided with another car. Police believe that the driver was impaired at the time of the accident. Both drivers were taken to local trauma centers after suffering serious, but non-life-threatening, injuries. A third man suffered minor injuries and was treated at the scene. The names of the victims have not been released and police continue to investigate the crash to determine if charges will be filed. Lanes of traffic in the area were closed until 10 a.m. on Tuesday. Unfortunately, the end of the year often means an increased number of DUI accidents in the area. According to the 2014 Arizona Department of Transportation car crash statistics, about 25 percent of all alcohol related accidents occur during the last three months of the year. During the same time period, 20 fatal alcohol-related accidents were reported each month. Just one week ago, an alcohol-related accident in Avondale left two people dead. Another DUI accident in Phoenix on Nov. 12 led to a two-vehicle accident that left one man dead. 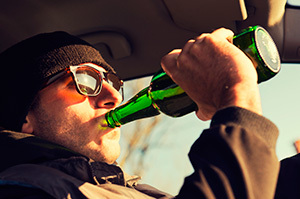 At Phillips Law Group, we advise all motorists to never get behind the wheel under the influence. Unfortunately, there is not much that can be done to control the actions of others. If you are ever injured in a car crash caused by intoxicated driver, contact the team of attorneys at Phillips Law Group. With years of experience handling car accident claims and helping the residents of Tempe, Phoenix and many more areas throughout Arizona, our personal injury lawyers can help you obtain the compensation you deserve.